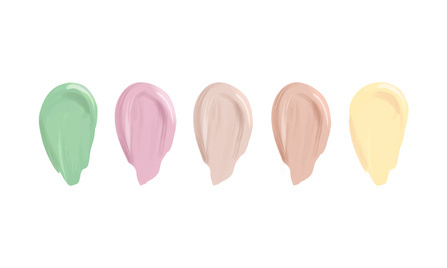 Do You Offer Mineral Makeup Color Correctors? No we don't, and for a very good reason. When a color corrector is used on the skin, it may diminish flaws, but it can actually have an adverse effect on your shade of mineral makeup foundation. Although this works for the most part when applied directly to skin in color theory, yet in truth, once the color corrector blends with your regular mineral makeup, it will not provide true skin tones but will actually alter the shade and the look will be less than desirable. We created our mineral foundations to also be used to conceal problem areas and we suggest using a lighter shade within your skin tone for this purpose. This can be done by blending your correct shade with our Clear Base. You will be able to achieve excellent flawless coverage with a brighter, natural looking complexion without changing your undertone and overtone, and save money in the process. The compliments we receive about our mineral makeup, followed by the questions or concerns, always seem to be the same... how much they love our mineral foundations, but don't understand why it changes color when they apply it over a green color corrector they purchased at the drug store. 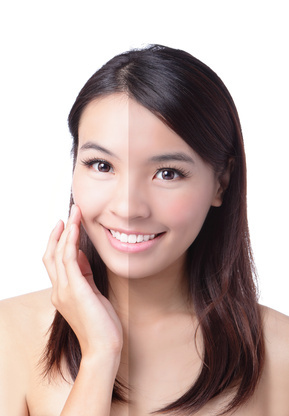 Unfortunately, the practice of color correcting is still being taught on videos, at cosmetic counters and similar venues as the way to control redness, orange skin or blue under eye circles through the use of a color corrector that is found in green, yellow, lavender, and sometimes peach. The reality is, in today's era of more translucent cosmetics such as mineral makeup, hi-def television and digital photography that sees every little facial imperfection, woman trying to achieve a flawless complexion cannot accomplish this using dated color correction methods. The sales pitch is always the same for color correctors; Green is for muting redness, Yellow is for blue under eye circles or bruising, and Lavender is for toning down yellowish to orange skin, and supposedly this will make our facial tones perfect when actually the opposite is true. 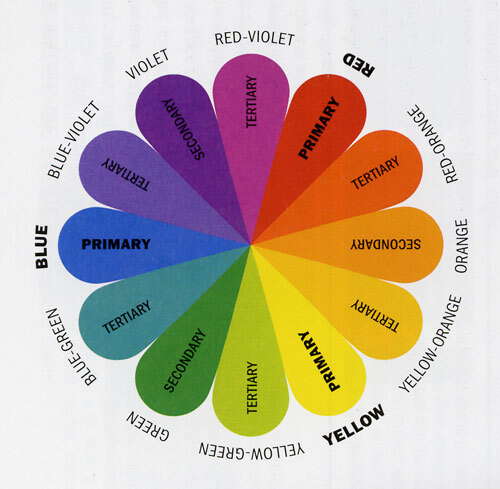 It is as simple as reeducating ourselves and understanding that this is "color" we are using to try to correct facial imperfections and / or to try and correct certain undertones and overtones. Despite everything we thought about correcting flaws for all these years, when we add one of these colors that is separate from a perfect blend of mineral makeup foundation shading, it will alter the skin tone no matter what! Green is a perfect example and most popular: in its' excellent ability to mute redness, it will do exactly the same to the red tones in a foundation by turning them gray, basically making the skin appear ashen or ghostly, essentially creating a dead gray pall on the skin. In fact, many Olive shades are created with green in order to beige or gray out the shade so to speak because Olive skinned women possess very little red in their skin tone. But green is a poor substitute for creating a true beautiful Olive shade. Skin is not green and Olive skin is not gray so even using green to create Olive / Beige shades or to neutralize red on the skin will only make the wearer appear very ashen or worse yet, muddy. We use a proprietary blend of true skin tone pigments to create our perfect Olive shades without making Olive skin turn ashy, gray or muddy. Lavender: works wonderfully on toning down orange skin or counteracts sallow or bruised skin as the bruise begins to yellow, and controls hyper-pigmentation of the skin. But again, if used with the incorrect shade such as an Olive or Pink overtone, this will also make the face appear ashen or purplish because it contains a blue and red combination. If you have strong yellow undertones, then using this as a color corrector will give the skin a green cast. Yellow: works well at reducing blue bruising, and blue under eye circles. If overused it will completely alter true undertones making the correct foundation incorrect, such as if you have strong pink overtones it will then make the skin appear orange. Peach (Apricot): also added to the color correction line at times for correcting sallow skin types or dark areas with hyper-pigmentation. However, there is never a good reason to use this awful shade unless, quite plainly, you enjoy orange skin. True concentrated color correctors will never create the natural appearance our customers are trying to achieve with their mineral makeup since the exact purpose of our minerals is to protect skin and to create the appearance of a natural, healthy complexion restored once again, making mineral makeup the preferred choice among dermatologists and medical aestheticians. Sterling Minerals was formulated to not only achieve skin healthy benefits but to recreate true skin tone foundation shades for every ethnicity. If you need to color correct when using our mineral makeup, we have lovely Blush shades that can also work as a face color, but they are identified as being used to subtly change the skin tone. In fact, we recommend applying them over the top of the foundation so the change can be achieved slowly to suit your needs. Whatever color issue the mineral foundation doesn't correct (this rarely happens if ever), then the blush shade can be used to give a touch more color correction without altering the entire complexion of the face. Complete shade descriptions are available in every shade on how they can be used to color correct varying skin tones. Using our mineral foundation shades like Fiorella (Ivory, Yellow and Pink) or Jennifer (Ivory, Yellow) will work 100% better and are highly recommended for doing the job as a color corrector because they are formulated with true skin tone pigments to correct the facial area needing some help. Apply them in heavier concentration, perhaps by using additional moisturizer or our preferred Moist Method Application Technique. You then gently press and sweep your natural mineral foundation shade over the top. All of our shades are designed to blend and complement the foundation you use and your natural skin tone, so the colors will meld perfectly! If Lavender is the color corrector you require based on our description above, then our Lilac blush shade is best suited for lighter skin and Indigo for a deeper skin tone. If Yellow color corrector is what you prefer then our foundation shade Calla can work best. Our minerals are easy to use and completely goof proof. Many of our customers have become utterly confused as to what happened to that beautiful shade they brought home after they used another brand of color corrector. It may have looked natural in artificial light, but once they go out into the natural light, the shade suddenly looks odd. Typically they blame the weird color (which has either turned gray or muddy) on the foundation shade they picked because they didn't try it without the ritual of color correction first. Frustration continues as they seek out that perfect foundation shade, when in reality it is the seemingly benign color corrector lurking in the makeup drawer, dooming their search from the get go. When we assisted those customers that were continuing to use color correction, primarily Green, they learned that once they removed the color corrector from their mineral makeup regimen, the foundation shade they chose was perfect and the best match they found as opposed to the many other brands they tried. The advice we've provided to our customers using color correction in the past, is that they would be far better off reducing facial imperfections with our mineral makeup by using the methods we recommend when applying their foundation or blush shade. This is the only way to reflect a true natural skin pigment rather than ever using one of the green, yellow, lavender, or peach color correctors to try and accomplish what should be a simple task.